It gives plan administrators a guide to what the plan should accomplish. This helps to provide a high-level overview of the areas that must be addressed within the document as it is being created and maintained. It gives stakeholders and other personnel a clearer understanding of the document’s purpose and scope. The core goal of your plan is to prepare the business for a disaster scenario, thus minimizing operational downtime when such an event occurs. But as you’re writing the plan, you need to be more specific. There are likely several specific business continuity plan objectives, which you should include as a brief list at the opening of your BCP. This is one of the most fundamental objectives of business continuity management. Your BCP plan template is more than just a document to be stored away and never seen again. It’s a step-by-step guide that will be used by your recovery teams during an actual disaster situation. Who is on those disaster recovery teams? What are their roles? How can they be reached in an emergency? Identifying this information is one of the most important goals of your business continuity planning. Another crucial purpose of creating a BCP is identifying the various threats to your operations. 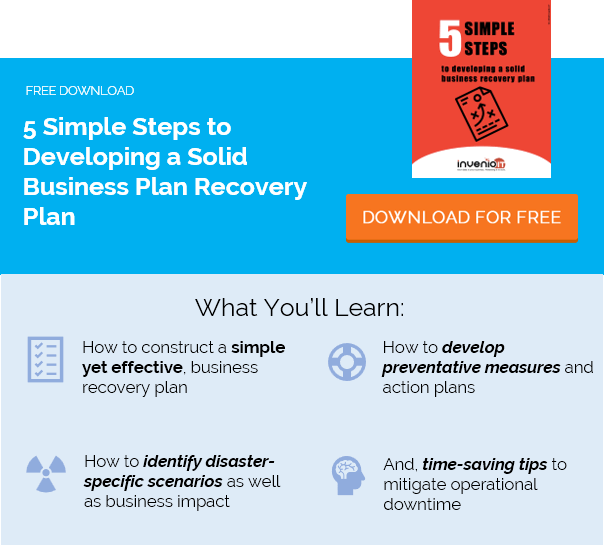 In a later section, your plan will outline different types of disasters that could disrupt the business. You will also include the impact of each scenario: how much damage would be caused, how long the recovery would take, the cost of operational losses and so on. Your plan will provide the specific procedures that need to be followed to assist in recovery. Chances are, when disaster strikes, personnel won’t remember exactly what they’re supposed to do. Your disaster recovery teams should have a general idea, but if needed they’ll be able to consult the document to follow the exact procedures as they’re listed. One of the most important IT business continuity plan objectives is to identify where critical data and other assets are being stored. This allows recovery teams to begin recovery even if key IT personnel are unavailable. Imagine, for example, a scenario in which you had no IT workforce. There must be, at least, a footprint for other personnel or stakeholders to follow. Any confusion will significantly impede the recovery process. Who communicates with the client during an emergency? Who notifies the workforce? Who speaks to the media? By having a business continuity management policy in place, recovery personnel will understand their roles for both internal and external emergency communications. Recovery teams need to know where and how to relocate operations, and with what resources. Your BCP will outline the availability of any back-up office space or the procedures for securing a new space rapidly. Additionally, it will cite the availability of back-up physical resources, such as workstations and devices. A business stakeholder wants to know, “What are we doing to prevent ransomware situations like the one I just read about in the news?” This is another reason for your BCP. It will outline the technologies, tools and protocols that are already in place to prevent or mitigate the effects of a disaster. Any holes in your continuity planning must be addressed. The BCP is as much a process as it is a static document. It’s a work in progress, in which risks need to be constantly evaluated. Identify scenarios that would leave operations unprotected, and propose specific action steps that should be taken immediately. For more information on business continuity planning, check us out.